Although some have criticised the Paris agreement as unfair for western countries, we may need to go even further towards consumption-based accounting to limit climate change and support an inclusive economic model. 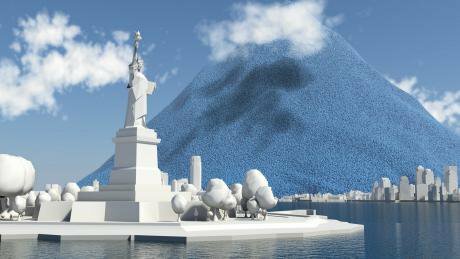 Visualisation of New York City's daily carbon emissions. Credit: Carbon Visuals/Flickr. Some rights reserved.On June 1, 2017 President Trump announced that the US will withdraw from the Paris Climate Agreement. The reason he cited for this decision was that the deal negotiated by his predecessor in 2015 was unfair to the country and that it imposes unacceptable financial economic burdens. In the days following this announcement, many commentators put forward convincing arguments and figures on how the US would actually benefit from preventing the catastrophic impacts of climate change and how a transition to renewable energy would in the long run create more jobs than those lost in polluting sectors, such as coal mining. However, it is undeniable that certain costs will be inherent in the implementation of the pledges made by the US at COP21. For instance, the energy transition is expected to be faster in developed countries as emerging economies will be allowed to have their use of fossil fuels peak at a later date. And there is an expected transfer of funds from developed to developing countries through the Green Climate Fund to the tune of USD 100 billion annually, expected to increase further after 2025. Developed countries have the moral duty to help developing countries to pursue the energy transition. The need for climate finance and different mitigation scenarios ensues from the UN Framework Convention on Climate Change’s principle of “common but differentiated responsibilities”. This means that developed countries have the moral duty to help developing countries to pursue the energy transition and equip themselves for the effects of climate change, because the former have a historical responsibility for pumping the vast majority of CO2 into the atmosphere and, thus, triggering climate change. Indeed, if we look at the global cumulative CO2 emissions in the period 1850-2011 we see that out of the total amount 27% has been emitted by the US, 25% by the EU, and only 11% by China as a distant third. However, in 2006 China became the world’s biggest CO2 emitter, a title that it holds to this day. Furthermore, if we look at global cumulative CO2 emissions in the period 1990-2011 we discover that out of the total amount 16% has been emitted by the US, 15% by China, and 12% by the EU. This last figure might raise questions regarding the notion that China is still a developing country that should be allowed to peak its emissions at a later date than developed countries and that it is morally entitled to receive funding from the Green Climate Fund. But a better question to be asked at this point is: what are the majority of China’s fossil fuels burnt for? The increase in Chinese CO2 emissions since the 90s could be directly attributed to the acceleration of trade globalization. According to a study, almost 50% of the country’s total emissions in the period 2002-2008 were generated in the export sphere. The growth of Chinese CO2 emissions is driven by consumption in the west rather than by an increase in welfare in China. Based on the analysis of another study, other socio-economic drivers were relatively puny compared to exports: for the years 2002-2005, population growth and ‘changing lifestyles’ contributed 2% and 1% of growth in emissions respectively, government expenditure and household consumption 7% each. These findings reveal that the production of goods for export was the main source of the plume of smoke shooting up from Chinese territory. Catching up with the growth of ‘emissions embodied in trade’, a rising chorus of researchers and activists advocate a reallocation of responsibility, a shift from production-based to consumption-based accounting, which would provide a more realistic picture of ‘how and why human actions affect CO2 emissions’. The growth of Chinese CO2 emissions is driven by consumption in the west rather than by an increase in welfare in China. Why should China be held accountable for CO2 released for the benefit of American T-shirt wearers? In fact, the carbon footprint of a person is not a function of what they produce, but of what they consume, much of which will be imported from other nations still doing the dirty work of manufacturing. But what drove this dystopian split in the west between a person’s carbon footprint and their country’s responsibility in global CO2 emissions? In the book Fossil Capital, Andreas Malm, Professor of Human Ecology at Lund University, investigates the role played by foreign capitalists in generating this dynamic. He argues that the Chinese export miracle would not have come about without their presence. In the 1980s, foreign-invested enterprises (that is, either joint ventures or wholly foreign-owned companies) produced a meagre 0.1 percent of the goods exported from China. In 2001, the share exceeded 50 percent for the first time, and it stayed above that mark throughout the decade. And the consequence of this flood of foreign capital into China was that of all the massive growth in Chinese energy consumption between 1987 and 2007, over half occurred in just the final five years, with industry the most voracious sector by far. At the turn of the millennium, industry accounted for more than two-thirds of total final energy consumption in China. The relative contribution of households to energy use declined, as the absolute magnitude of residential energy stayed level between 1987 and 2008, in spite of a 20% increase in population. More CO2 is emitted in the production of one T-shirt in Bangladesh than if the same T-shirt were to be produced in Sweden. Since CO2 emissions follow industrialization, the 90s marked an explosion in China’s carbon footprint. And the increase in global emissions was worse than would have been the case if the same amount of capital had remained in the investors’ countries of origin. In fact, wealthy nations tend to have lower carbon intensity than poor ones: more CO2 is emitted in the production of one T-shirt in Bangladesh than if the same T-shirt were to be produced in Sweden. But as Malm explains eloquently in his book, globally mobile capital will relocate factories to situations where labour is cheap by means of new rounds of massive consumption of fossil energy. China had, relatively speaking, low wages and high carbon intensity, while other countries had high wages and low carbon intensity. Capital flowed from the latter to the former. It moved towards higher rates of surplus-value and higher levels of emissions per unit produced. This trend is increasingly being replicated in other countries in the global South as foreign investments relocate away from China in search of a cheaper workforce, as the cost of labour increases there. This analysis shows that the vast majority of energy-related CO2 emissions generated in developing countries up to this day originate from industrial activities for exports rather than from household consumption. But people have a basic human right to subsistence which cannot be met without a certain degree of economic development that, at the level of current technology is dependent on fossil fuels. It is therefore reasonable to assume that if people in developing countries are to increase their welfare, they will have to expand their carbon footprint. As carbon dioxide emitted into the atmosphere accumulates over time, climatologists have been able to measure how many more tons of CO2 can be emitted before overshooting the goal to limit warming to the ‘well below 2°C above pre-industrial levels’ enshrined in the Paris Climate Agreement. The amount of CO2 that can still be emitted before the cumulative effect of all emissions pushes the world beyond the limit is known as ‘carbon budget’. The calculated carbon budget makes CO2 emissions a scarce resource that needs to be redistributed across the world. But what principle of distributive justice should govern the allocation of remaining CO2 emissions? Should all people across the world be entitled to the same amount of CO2 emissions? I argue against this course of action on two accounts. Firstly, as explained before, global cumulative emissions since the Industrial Revolution have been unevenly emitted around the world. Early industrialized countries have triggered an unprecedented process of capital accumulation and economic development, thanks to access to a technology that could transform fossil fuels into a constant and reliable energy source. While these countries can boast having invented the technology for doing so, they also appropriated an unfair share of a global common in the process, that is the atmosphere. In fact, the atmosphere is a key global common-pool resource in its function as a sink for CO2. This unequal appropriation is known as ‘ecological debt’. The world should move away from production- based to consumption- based accounting.Secondly, the marginal benefit of one more ton of CO2 emissions increases human welfare in developing countries more than in developed ones. In fact, new emissions in the global South would be more likely to be devoted to meeting primary services, such as hospital and schools, rather than to individual luxury consumption. But in order to avoid the continuation of the trend analysed by Malm in the Chinese context, the world should move away from production-based to consumption-based accounting, so that the carbon budget allocated to developing countries is used for local consumption rather than being exported through emissions embodied in trade. The concept of carbon budget obviously does not take away from the need for an energy transition. In fact, the higher a share of goods and services can be generated with renewable energy, the more can be done with one tonne of CO2. However, given the low speed at which countries are phasing out their use of fossil fuels, the remaining carbon budget as of 2017 seems too limited for the entire global population to attain full social and economic development. In the mind of green growth advocates, a way out of this wicked problem would be to expand the remaining carbon budget through ‘negative-emission technologies’. These technologies are currently at little more than a conceptual stage of development. Yet, as Kevin Anderson of the Tyndall Centre for Climate Change Research explains, they are ubiquitous within IPCC’s climate models. A few years ago, these exotic Dr Strangelove options were discussed only as last-ditch contingencies. Now they are Plan A.The most hyped negative-emissions technology is the ‘Biomass Energy Carbon Capture and Storage’ (BECCS). It entails apportioning huge swathes of the planet’s landmass to the growing of bioenergy crops for absorbing CO2 through photosynthesis as they grow. Periodically, these crops are harvested and combusted in thermal power stations. The CO2 emitted through the combustion is then stripped from the waste gases, compressed almost to a liquid and stored deep underground in various geological formations for a millennium. But to make the deployment of BECCS increase the carbon budget by a meaningful magnitude, it would be necessary to spend decades planting and harvesting energy crops over an area of one to three times that of India. All this at a time when more land is needed for growing biofuels in order to wean transportation systems off from oil and for growing food for a global population soon reaching 9 billion people. As BECCS has to date been deployed only at the level of pilot experiment and nobody knows if it can be used worldwide to remove enough carbon dioxide to slow warming, the scale of the assumption being made here is breathtaking. A few years ago, these exotic Dr Strangelove options were discussed only as last-ditch contingencies. Now they are Plan A. It is increasingly self-evident that given the very tight carbon budget we are left with, neither a break-neck expansion of renewable energy nor the deployment of Faustian geoengineering plans will be enough to avoid breaching the 2°C limit. We have to question the way in which energy underpins our quest for infinite economic growth. Deciding to pursue an alternative approach to the climate crisis begs profound political, economic, and social questions – questions that undermine the rhetoric maintaining that infinite economic growth on a finite planet is possible. Growth is a substitute for equality of income.Our age’s obsession with economic growth is that it makes the debate on wealth and resource redistribution superfluous. Growth is a substitute for equality of income. So long as there is growth there is hope, and that makes large income differentials tolerable. But the need for downscaling our energy demand in order to avoid runaway climate change calls into question the tenets of our economic system resting on infinite growth. However, the poorest nations still need to develop their economic capacities in some form simply to provide for themselves a dignified standard of living. And it would be inappropriate to sacrifice improvements in the welfare of the global poor for the sake of reducing carbon emissions. But this only puts greater pressure on the relatively small proportion of the globe’s population with higher emissions to reconsider their lifestyle. Societies in developed countries must make room for the billions of people in the global South that do not have access to basic services and need to increase their energy and resource consumption to attain the Sustainable Development Goals adopted by the UN in 2015. The only plausible answer to the wicked problem of climate change is for the global North to reduce its emissions by an amount greater than the increase necessary in the global South. To this end, there is an increasing interest among academics and activists on the need to downscale economies in developed countries. A debate that centers around the concept of ‘degrowth’. There is an increasing interest among academics and activists on the need to downscale economies in developed countries – the concept of ‘degrowth’. The degrowth movement argues that to achieve ecological sustainability, developed countries need to initiate a process of planned economic contraction, in the sense of reducing the absolute level (not merely per unit level) of ecological impact caused by economic activity. This entails an equitable downscaling of production and consumption that will reduce societies’ throughput of energy and raw materials. However, the shift should not only entail a smaller social metabolism, but more importantly a society with a metabolism that has a different structure and serves new functions. Ideally, in developed countries this process should continue until ecological sustainability has been achieved, at which point nations should adopt a steady-state economic model. As for the poorest countries, a phase of clean and equitable growth is still required to achieve a dignified standard of living, but eventually those developing nations too will need to transition to a steady-state economy. For all these reasons, claiming that the Paris Climate Agreement is unfair on developed countries given their current consumption-based emissions per capita is patently ridiculous. The opposite is true: achieving international climate justice and allowing the global poor room for improving their welfare require even more efforts from the part of developed countries. But as the techno-fixes advocated by the supporters of ‘sustainable development’ fall short of the climate challenge and would surely cause the world to overshoot the remaining carbon budget, we must shrink the ecological footprint of the global North to allow the whole of humanity to live within its planetary boundaries.